SHELBYVILLE, Ky.— Jeptha Creed owner and master distiller, Joyce Nethery, is excited to announce that they recently filled their 1000th 53-gallon barrel of bourbon. The highly anticipated bourbon is set to release this summer and Nethery could not be more excited. On Friday, Feb. 15, 2019 at 3 p.m. the Nethery family gathered with a number of supporters as Joyce filled the 1000th barrel. Jeptha Creed is committed to creating every spirit using their Ground to Glass concept. Every ingredient used in their bourbon, vodka, moonshine, whiskey and brandy is grown on the Nethery family farm or sourced from other local farms. Their unique strain of Bloody Butcher Corn offers a delicious sweet, nutty flavor other spirits do not have. Jeptha Creed has grown tremendously since opening two years ago. From distilling the first legal barrel of bourbon in Shelby County since Prohibition to filling their 1,000th barrel – they cannot wait to officially share it with you this summer. Located in Shelbyville, Kentucky, Jeptha Creed Distillery uses old fashioned methods to meet today’s demanding modern tastes. They use only the finest ingredients, locally grown and sourced to ensure their products meet the highest expectations for quality and flavor. 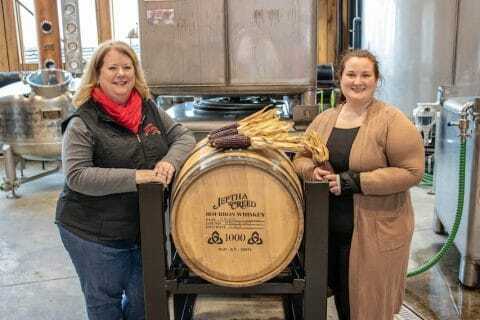 Owned and operated by dynamic mother-and-daughter duo Joyce and Autumn Nethery, Jeptha Creed sits on 64 acres of farmland, where they grow the Bloody Butcher Corn used for all of their products, including vodka, moonshine and bourbon. For more information on the distillery or to book a tour visit their website at jepthacreed.com.